Research indicates that diet can help reduce inflammation, bringing relief from fibromyalgia and other chronic pain. Here are three diet basics we can communicate to patients. Research shows that diet should be an integral part of a pain management program — especially as patients age. A vegan or Mediterranean diet — or healthier eating inspired by these diets — can control insulin and cholesterol levels and reduce inflammation, which is the pain culprit. Inflammation is the body’s immune response to “purify” and remove toxins, and over time it can trigger chronic diseases. A fair amount of research indicates that diet can correct fibromyalgia and chronic pain symptoms. Patients who have followed rigorous vegan or Mediterranean diets have seen complete turnarounds in their pain symptoms. Consume eight to nine servings of vegetables each day. A couple of those servings can be fruit. Eat red meat the way we eat turkey right now — twice a year. Have it on very special occasions, very infrequently. Instead, include fish as the “meat” or eat vegetarian main dishes. Chicken is neutral — not harmful but not beneficial in the anti-inflammatory sense. Dr. Welches is a specialist in Cleveland Clinic’s Department of Pain Management. He can be reached at welchew@ccf.org or 216.295.1010. 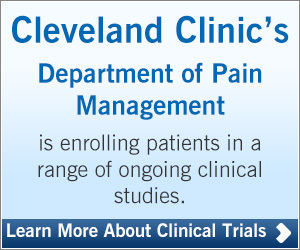 A site for physicians and healthcare professionals from Cleveland Clinic’s Department of Pain Management. Our physician newsletter helps you stay informed on the latest in pain management innovations, clinical trials and research and provide practical patient care insight from the specialists in the Department of Pain Management.